To make the marinade, whisk together chicken stock, soy sauce, honey, rice wine vinegar, brown sugar, cornstarch, 1 tablespoon sesame oil and 1/2 cup water in a large bowl. In a gallon size Ziploc bag or large bowl, combine chicken and 6 tablespoons of the marinade; marinate for at least 30 minutes, turning the bag occasionally. Heat remaining 1 tablespoon sesame oil in a medium saucepan over medium heat. Add garlic, ginger and chili paste and cook, stirring frequently, until fragrant, about 1-2 minutes. Stir in 2 cups marinade until slightly thickened, about 3-4 minutes; keep warm. In a large bowl, combine cornstarch, flour, baking soda and remaining marinade until it resembles coarse meal. Dredge chicken in the egg whites, then dredge in the cornstarch mixture, pressing to coat. Heat corn oil in a large stockpot or Dutch oven to 350 degrees F. Add chicken and fry until golden brown, about 2-3 minutes. Transfer to a paper towel-lined plate. 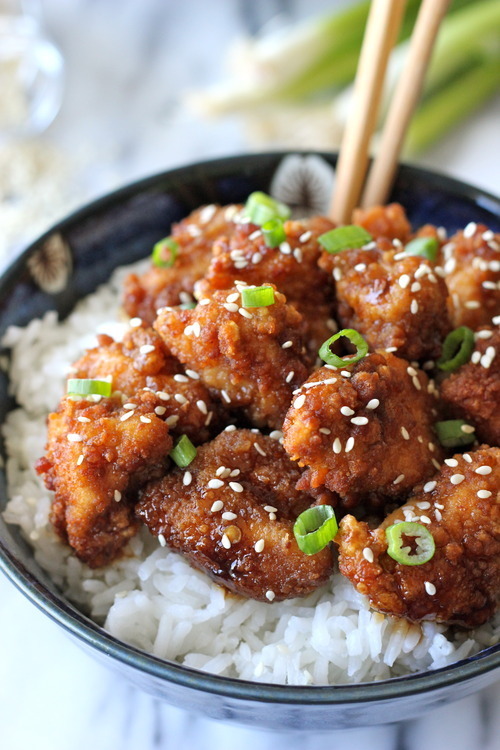 Serve chicken immediately, tossed or drizzled with the marinade, garnished with sesame seeds and green onion.